Hi Readers! Today I’m sharing Strawberry Shortcake’s 5th grade daily schedule with you. 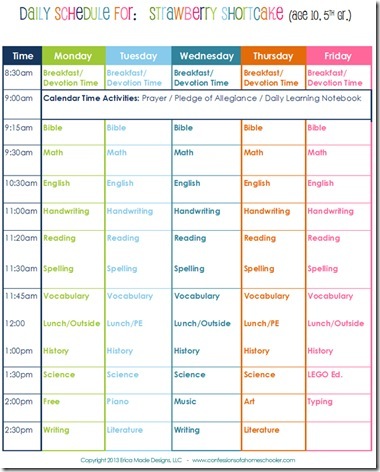 If you’ve missed my previous posts, you can see the ‘Daily Homeschool Schedule’ series here. Strawberry Shortcake is currently 10 years old, and in the 5th grade. She definitely has a filled schedule this year, but she’s doing great and enjoying school! As you’ll probably notice, Strawberry Shortcake’s schedule is virtually identical to Turbo’s. I find it works well to keep their schedule’s in line with one another. That way neither feel that they’re doing more or less work even though the work level is different. Since they’re only 1 grade apart it makes it easier to teach them together as well. As I mentioned we are currently doing Bible, History, Science, and Literature as a group which makes it a bit easier on me. Then Turbo and Strawberry Shortcake do writing together too. Science: Abeka Science, & some of my scientist units. Have a scheduling tip to share? Make sure to leave a comment below! I’m still not quite sure why kids this age need a strict schedule. Once my kids reached 4th grade we did some reading together and I gave them their pile of stuff and they worked on it. They knew that there were no privileges until that pile was done. This is our first year to homeschool our 4 kids and I love your website! Very helpful! With this 5th grade schedule, does she mainly read and do these lessons on her own while you work with the younger ones? How do you work with all 4 kids? More structured than this? I can’t even imagine! We love keeping a schedule like this!! My two oldest are only fifteen months apart and it’s great for bringing them together for some lessons and doing the bus stop method for others. I thought we were the only crazies with an array of subjects, but I see it works for your family, too. My children thrive in a busy, structured day. However I can see how others don’t. That’s what makes homeschooling so amazing!! Thank you for sharing!!! This looks great! And I totally get you! Why anyone would criticize this, I’m not sure? It’s just an example. And a good example worth drawing from, it is. First of all, we know that God is a God not of disorder. (1 Cor: 14:33) Order brings blessings – it works out the kinks and the frustrations and it brings peace. I know that when I write out a schedule I instantly feel at peace. I know that I can get everything done and still have time leftover for me and for fun. I have an outline of what needs to be done and when. Having said that, we all know that we are not slaves to the clock and that adjustments can always be made. I am definitely not one of those that always stick to a routine and even worse I rarely say “Work first! Play later.” I am definitely scattered and…well, let’s just say it: I have A.D.D.! And so do my kids. But that is where that basic outline and schedule/routine is worth millions to us. But yes, of course we “stack it” and do the pile. But for the most part, we are working within those limits that help guide us throughout our day. And I like that although, yes, it’s a long day, your lessons are short and varied. Good for you! And thank you for your blog! I’m thoroughly enjoying it. Is it just me or is this a long day? My 5th grader gets his work done in 3 hours. Hi Erica, I’ve found so many of your tips helpful! Thank you for sharing. This is actually a short day compared with the rigorous program they have us doing with the government charter school. There’s no way we could fit in science and history in 1/2 hour, do literature only 2xs/wk., or do vocab. in such a short time period. We start about the same time and are often not done before dinner. They’ve got us going crazy! Keeping kids moving and not giving them too much is key, I think. Erica, I notice you do not include Spanish any more. Will you put that back into your curriculum? I’m considering buying The Learnables Spanish program. My sons’ friends are learning Spanish in public school and they feel left out. Thanks for the schedules. Where is Technology, at least one foreign language, and Current Events/Government that my 5th grader gets at school? Do you include them on nights/weekends? Also, just curious how many times per week you and everyone else schedule playdates/social time? We do one for each kid on a weeknight and one per kid on the weekend. This is aside from seeing friends at sports, birthday parties each weekend, etc. of course. We are attending a co-op program right now once per week that handles those things. So I don’t really do them at home this year. Previous years we did Spanish, and typing a few days per week. As for playdates, we don’t have a set schedule for those. We just do them as time allows and friends are around. We also live in an area with a lot of kiddos, so it seems like we have “playdates” all the time by default LOL! I’m confused by your daily schedule and your post about workboxes. We are currently using the workbox system (to some degree) and I am trying to perfect it. Do your kids follow a strict time schedule or do they do their work at their own pace using the workbox system? I have been following you for about 2 years now and I LOVE your blog. 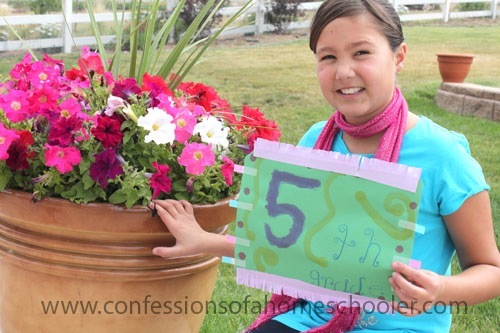 You have absolutely been a blessing to my family along this homeschool process. I pray that I can be as organized as you are one day and that I will be able to help others as you have helped me. Just starting to blog as well…thank you for all you do, I don’t know how you keep up with it all.